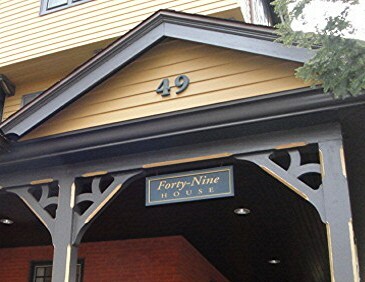 When the last ‘forty-niner goes on eternal patrol (as they say in the submarine force), the class’s shining legacy will be 49 House, a three-story, brick-and-frame, Queen-Anne-style building at 49 College Avenue, directly across the street from the campus of St. John’s College. For anyone out there who is unaware of USNA Class of 1949’s involvement in funding the renovation of the building, the following is a brief rundown. 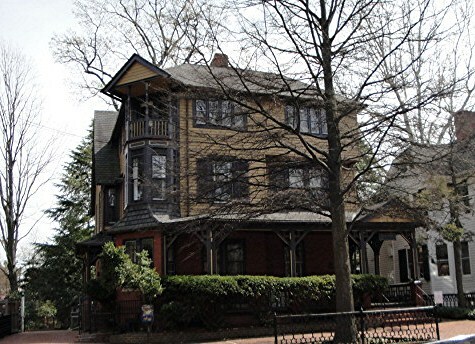 The Naval Academy Alumni Association, which was bursting at the seams in its Ogle Hall home, on the corner of College Avenue and Prince George Street, purchased the building at 49 College Avenue in 1983, with an eye to making it into additional office space once funds were available. In 1995, USNA Class of 1949 agreed to join with the Alumni Association in funding the renovation and upkeep of the building as the class’s 50th anniversary gift to its alma mater. The class’s successful fundraising efforts contributed heavily to the initial renovation and also provided a viable fund dedicated to ongoing upkeep of the building. The interior of the building was completely renovated and equipped with state-of-the-art: heating and air-conditioning systems; fiber optic computer systems; the most modern phone systems; highly insulated walls and floors; in-house printers and work stations; anti-EMF underground wiring; and many other technological improvements and creature-comfort features. In addition to workspace, there is a reception area as well as a conference room, and a modern apartment available for official guests in the basement. The building’s exterior, which was in good condition, required only painting and a new roof. In restoring this building, the Naval Academy Alumni Association and the Class of 1949 have provided a wonderful adaptive re-use for a grand old house, now in its third century. 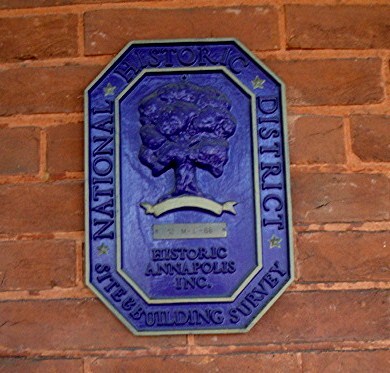 Historic Annapolis Foundation (the preservation organization for Annapolis and Anne Arundel County) awards markers to noteworthy buildings that merit recognition and are maintained in a manner appropriate to their architectural significance. The markers are color-coded to identify the construction period. This plaque’s purple color dates the structure to the Victorian period (1837-1901). Known simply as 49 House in its new life, the building is home to the Alumni Association Development Division, which supports the needs of the Naval Academy and the Brigade of Midshipmen. 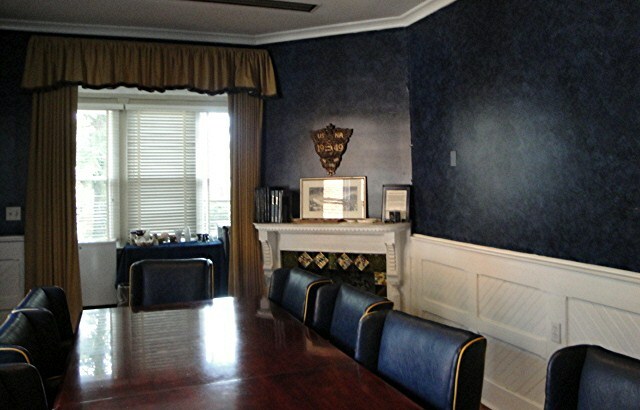 Moreover, the 49 House conference room provides meeting space for visiting supporters of the Naval Academy. The gardens and wraparound porch afford a pleasant site for midshipmen and alumni functions. The house with its relatively low maintenance and utility costs is a handsome and efficient facility, which will serve the Naval Academy Alumni Association for many years. A member of USNA Class of 1880 (Francis Joy Haeseler) constructed the house in 1887; hence, it seems appropriate that more than a century later the house is once again associated with the Naval Academy. When next in Annapolis, make sure to pay a visit to Class of 1949’s jewel in the crown, a visible footprint for the future. Our thanks go to: Ace Boughton, Class of 1949 President (1994-1999) and his Executive Committee for their leadership in undertaking this noteworthy class project; John Dobson, one of the class’s CEC engineers, for providing oversight of the work and for his expertise solving problems that arose during the renovation; and lastly to all classmates for their initial contributions and their continuing support to meet future ’49 House requirements. The history of the Class of 1949 is still in development. Nonetheless, members can recall its early beginnings and many things of subsequent years. A ’49 ABSTRACT was prepared by Gene Shine (deceased) in 1994 and rewritten for dissemination during the 50th Class of 1949 Reunion titled A 50TH YEAR PROFILE OF THE CLASS OF 1949, U. S. NAVAL ACADEMY, October 1999. For those unaware of its existence, a condensation is given herein Attendees of the 50th Reunion should have a copy of the 20 plus page document. A copy is at 49 House along with a copy of LUCKY BAG, Nineteen Forty-Nine and other class memorabilia. The admission process was a 3-day evolution. a. The first day scheduled required a physical examination following check-in at the Administration Building. Failing initial examination the candidate was rejected for entry or scheduled for reexamination. 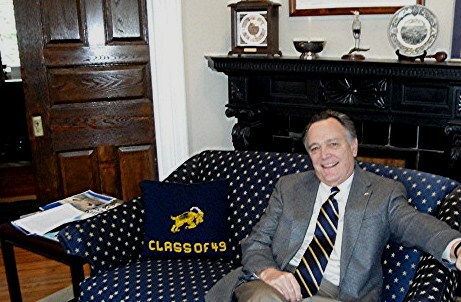 (Alternates at the Naval Academy Preparatory School (NAPS), at their homes, and elsewhere anxiously awaited failures of principal and alternates above them.) There were a number of failures. b. The second day those successfully passing their physicals assembled for individual posture photographs. (None of the candidates failed this event; however, several “died of shame” when a roommate stole his photo and sent to girl friends, inter alia.) The second event of that day was an explanatory talk by a member of the Executive Department and receipt of Executive Form No.41, Interpretation of Oath. It is unknown if any candidate changed his mind about entry at this point. The third event was receiving a room assignment, laundry number, and filling out forms incident to admission. Strangely, it was only following these events you were informed whether you passed your physical or not. If you were a member of the Navy you reported to the USS REINA MERCEDES for discharge. c. The third day candidates made their entrance deposit, and if formerly in the military showed discharge papers. All requirements satisfied, candidates gathered in Memorial Hall for taking the Oath and being sworn in as Midshipman, U. S. Navy. Noteworthy is the fact that if the second day was a Friday former military personnel were “civilians” over weekends. The last event of the third day was reporting to the Fourth Class Battalion office to commence life as a Plebe. Richard HOLZWARTH died on Christmas leave December 1945. Jacob HAMMER was a non-graduate. The remaining eight graduated with six returning with commissions to the USMC, Bill Bodager being commissioned in the Air Force and Frank BROWN opting for commissioning in the Navy. Of the 190 SECNAV enlisted Navy appointees, approximately 131 graduated with all but one (medical discharge) being commissioned in the Air Force, Marine Corps, and Navy. Six reached flag rank and 29 reached Captain in the Navy, and Colonel in the Air Force and Army. Many Congressional appointees in the Navy exercised an option to transfer to the Naval Academy Preparatory School, NRTC Bainbridge, MD, or its overflow facilities at Camp Perry, VA, to prepare for the USNA entrance examination alongside SECNAV candidates for appointments. Congressional appointees in the other services could also receive this training by transferring into the Navy. The majority of ‘49ers had college backgrounds, many leaving college just before graduation to come to USNA. Only one completed college receiving a degree. Several completed sufficient college to become commissioned officers. William RATLIFF Completed Plebe Year at West Point then entered USNA. All persons who at any time were members of the Class of 1949 at the U. S. Naval Academy, all as veterans and past members of the Armed Forces of the U. S. are considered to be members of the Class of 1949 unless they expressly relinquished their membership or were dismissed or forced to resign under less than honorable conditions from the Armed forces of the U. S. for the good of the service or good cause, or were expelled as a member by majority vote of members of the Class in good standing for reasons which are contrary to, or which endanger, the purposes, interests, or character of the Class Constitution. World War II ended August 14, 1945 (VJ Day) after entrance of the majority of the members of 1949 to USNA and prior to the beginning of the academic year (September 29, 1949). At that time there was no obligatory period of service for midshipman resigning - - even for former enlisted personnel who still had time remaining on their original enlistments. Consequently, a high rate of resignations occurred during the period August 1945 to September 1947. For example, 41 of the 200 SECNAV enlisted appointees resigned during this period. The overall attrition rate for the Class of 1949 was 31% - - the worst since the Classes of 1939 (effects of the Great Depression) and 1941 (effects of Great depression and impending war). Effecting Class of 1949 attrition can be ending a war and veterans desiring to pursue their desired careers. a. Of the 28 midshipmen turned back into the Class of 1949, 16 graduated in 1949.
b. Of the 31 1949 midshipmen turned back into the Class of 1950, 17 graduated in 1950.
c. Of the 3 1949 midshipmen advanced to the Class of 1948-B, 2 graduated in 1948. The number of demerits allowed before facing a board for dismissal from the USNA decreased yearly from 300 Plebe year to 150 First Class year. At least three ‘49ers had exemplary records in Conduct by standing number one for three of the four academic years. (It is noted that demerits acquired during Plebe Summer were expunged from records September 29, 1945 when Class of 1949 joined the Brigade for the academic year.) These “good guys were Warren Fredericks, Thomas Linton, and William Sample. Grading of midshipmen in the category of Leadership & Aptitude was a subjective system of grading based on observation by officers of the Executive Department, instructors in the professional subjects conducted the USNA and during summer training. The basic criteria were observation of midshipmen in a leadership role and expected performance in the military service ashore or afloat. Consistently leading the way were John C. Barrow, Edward Briggs, Dennis Stanfill, and Thomas Walters. Noteworthy is that several other “head and shoulder” performers in the Class of 1949 emerged during their naval and civilian service to high levels of leadership and responsibility. One of the 55 ‘49ers commissioned in the Marine Corps Calhoun KILLEEN, attained the rank of Major General. One of the 55 that were commissioned in the Air Force, Robert BERG, attained the rank of Brigadier General. The class data on honors, medals, and awards can only be approximate since many of our classmates (or their survivors) have apparently been too humble or shy to have kept the Alumni Association informed of awards and honors received. Additions to the following listing would be welcomed. In addition to the professions noted hereinabove, our ‘49er classmates have been involved in a very broad range of businesses, activities, and professions. To name each ‘49er and his individual activities would require many more pages than is intended in this Class abstract. Nevertheless, a brief listing of endeavors and occupations follow to enable readers to see the broad range of activities in which classmates performed. Following graduation members of the Class of 1949 scattered to the four winds. Some delayed leaving the Naval Academy to serve in marriage ceremonies as bridegrooms, best men, groomsmen, and participants in an “arch of steel”. Others enjoyed a respite of leave before proceeding to assigned duty stations. All left behind 4 years of fellowship that generated lifelong friends. Their careers in the military services and civilian life were seldom without being with or near classmates. There are many stories about these years that should be recorded as part of Class of 1949 history. Members are invited to report those events and times for posterity. Responsibility for maintaining the cohesiveness, fellowship, and communications of the class over the years has been by dedicated class members throughout the world. Leadership of activities has been headed by the following Presidents. Commencement of the second 50 years in the summer of 1995 wasn’t recognized as an occasion for celebration or even formally noted. It was a time of recall that the longest serving member on active duty had long since retired as had most classmates from their civilian careers. Almost all members had left the work force and entered the volunteer force. It is significant that as we entered our second half-century the class had undertaken a task, which would memorialize the Class of 1949 for the undetermined future. Before the 45th Reunion Ace BOUGHTON was informed he had been elected President of the class. The outgoing President, Ralph GHORMLEY, recommended that Ace contact the Alumni Association and introduce himself as the incoming President of the Class of 1949. During his meeting with Roland BRANDQUIST (’60), CEO of the Alumni Association, in November 1994 Ace was shown the Superintendent’s “wish list” for USNAAA projects. Number two on the list was “Refurbishment of 49 College Avenue” to a “Development Division Center”. Intrigued by the thought of a “49 House”, Ace investigated costs and commitments the class would be responsible for if the project was accepted by the Alumni Association. If the Class of 1949 was to undertake support of this project for the Alumni Association, members of the Executive Committee realized several preparatory steps should be taken. A major one was to establish the class as a tax exempt entity. Gene SHINE, Executive Vice President (lawyer) rewrote the class Constitution making the Class of 1949 a duly chartered Maryland Corporation. (Extracts appear at the CONSTITUTION page of the class website.) This action was completed November 18, 1994. Concurrently, a sufficient number of classmates voiced support of the project to provide confidence the $250,000 estimate could be met. December 1, 1994 the USNAAA Board of Trustees passed a motion to move as quickly as possible to commence renovations to the property. Following approval of the Class of 1949 Executive Committee, a letter was sent to class members announcing the project. There was overwhelming approval. A Memorandum of Agreement with the Alumni Association was signed March 13, 1995. Contributions have met renovation costs with surplus funds going into a maintenance account at the Alumni Association to meet future 49 House requirements. Refurbishment of 49 House was completed in December 1996 and officially opened by President BOUGHTON and Ron MARRYOUT (’57), CEO USNAAA, May 10, 1997. During work on the project Madelon McDONALD and Gene SHINE researched the history of 49 College Avenue and printed a brochure for distribution. Parts were used in a SHIPMATE July-August 1997 article of the official opening and A 50TH YEAR PROFILE OF THE CLASS OF 1949, U. S. NAVAL ACADEMY, OCTOBER 1999 that was available at the 50th Reunion. An article about 49 House is on the website at HISTORY. In keeping with the Alumni Association’s “Another Link in the Chain” project, during late January and early February 1999 six evening receptions were held with Class of 1949 bringing the Class of 1999 on board. Speakers at these events were Ace BOUGHTON, Wesley BROWN, Tom PARSONS, Bill READ, Gene SHINE, and Ed WALLER. Attending as hosts and hostesses were John and Flo BARROW, Mickey BOUGHTON, Crystal BROWN, Bill and Betty CALLAGHAN, Chet and Ella DAVIS, Jack and Nancy FROST, Fred and Laila GRABOWSKY, Bill and Betty GUTHRIE, Tom and Dornell KILCLINE, Mickey and Madelon McDONALD, Marty READ, Joan SHINE, Pete and DeEtte SWANSON, Jack and Pat VENABLE, Warren and Ursaula VOSSELLER, and Marty WALLER. Over 200 Class of 1999 midshipmen and other guests attended each evening. Besides the inspirational talks by the speakers, each member of Class of 1999 received a faux marble memento depicting a compass rose surrounded by an anchor chain which enclosed the class crests of ’49 and ’99 with the words “Another Link In The Chain”. In October 1999 members of the Class of 1949 assembled in Annapolis to enjoy its 50th Reunion headquartered at Loews Annapolis Hotel on West Street. Many things had changed over the years. The White Tavern was gone and to walk from the Yard to West Street had somehow become a longer, more tiring endeavor. Nevertheless, the 50th was well planned, well attended, and well remembered. With kudos to Ace, John BARROW relieved him as class President. The next 5 years involved a shocking change. Unlike the wars during which we served and those MidEast conflicts with Iraq in which many of our off-spring served we suffered attacks within the United States by a foreign enemy for the first time since 1812. September 11, 2001 a new war began – the “War Against Terrorism”. Although long out of uniform several classmates provided assistance and advice for confronting this “out of uniform” enemy. Approaching the 55th Reunion the Executive Committee considered reunion sites other than Annapolis in response to suggestions by many classmates weary of being crowded with other classes. Pete SWANSON and Jack BENOIT conducted a reconnaissance of Branson, MO facilities and the Executive Committee decided to slate reunion festivities there. The increased Homeland Security measures imposed on travel and complicated travel means reduced attendance. However, attendees enjoyed the new venue and facilities at Branson. Incoming President Harold TIPTON, Jr. relieved John BARROW while there. Activities of the class between 2004 and 2009 were dispersed at regional sites. Joint Christmas luncheons were held, usually at Army-Navy Country Club, with Annapolis and DC area classmates primary attendees augmented by not too distant classmates. Tidewater Virginia classmates had monthly luncheons with special occasions planned for the June 3 anniversary and Christmas season. The New York area group also had planned gatherings. And - - come Army-Navy game time whether 2 or 200, whether in the stadium or at a distant shore, classmates assembled to back the Blue and Gold to victory. The significant event of this era was the construction of the WESLEY A. BROWN FIELDHOUSE (see GALLERY) and its dedication May 10, 2008. Class of 1949 was invited to the ceremony honoring LCDR Wesley A. BROWN, USN (Ret) as the first black to graduate from the Naval Academy and recognize his continued service to the nation until retirement. Robert J. Schneller, Jr. wrote “Breaking the Color Barrier”, dedicated to Wes, about his entry and experiences at the Naval Academy. Additionally, the Naval Institute recently completed and published an oral history about Wes. September 26, 2009 President Hal TIPTON introduced the newly elected President of Class of 1949, Ewing R. McDONALD, Jr. at the 60th Reunion class meeting. We are 19 years into our Second 50 Years.